The calculated (B3LYP/Def2-TZVPP) geometry for I(CN)7 is similar to IH7, having essentially D5h symmetry. The C-I bond lengths range from 2.20Å (equatorial) to 2.10Å (axial); the Wiberg bond orders for these are respectively 0.482 and 0.609. The total bond orders are 3.94 (iodine), 3.91 (carbon) and 3.14 (nitrogen). The total carbon bond order for e.g. atom 2 is made up of 0.482 to I, 2.939 to N, 0.110 to C6, C7, 0.049 to C5, C8 and 0.040 to C3, C4. As with IH7, the erstwhile hypervalent iodine electrons have in fact departed from that atom, and taken up residence in the C…C regions. The NBO analysis confirms the electrons as originating from an effective iodine core (28), explicit I,C,N cores (46), 69.3 valence and 0.7 Rydberg (outer shell) electrons. 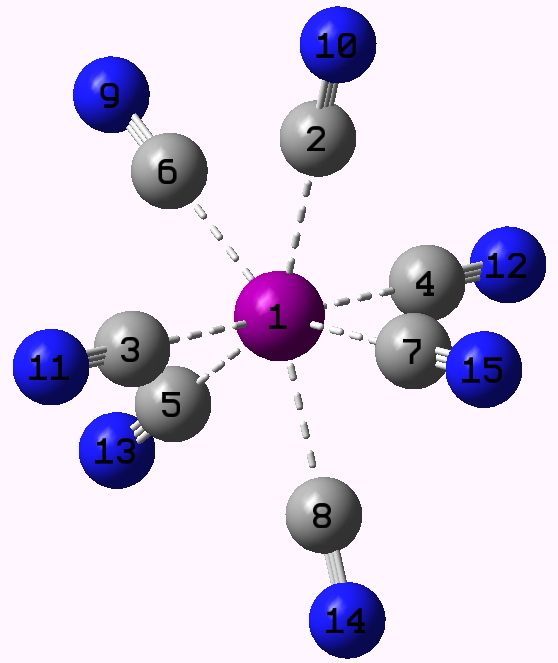 The molecular orbitals are shown in this post. Finally, for good measure, ELF analysis (on top of an effective core of 28) integrates to an outer core of 17.78 on iodine and a valence shell which includes 17.5 electrons distributed in seven explicit C-I disynaptic basins of ~2.5 electrons each. These 17.5 electrons can be considered as originating from ~10 (non-bonding?) electrons corresponding to the filled iodine 5d-shell, and ~7.5 shared bonding electrons in the iodine 5s/5p shell (the ELF procedure cannot distinguish between the 5d and 5s/5p electrons). There is no indication from these integrations that the iodine valence shells are expanded (i.e. from 10 for the 5d or from 8 for the 5s/5p). As with IH7, this molecule shows absolutely no evidence of being hypervalent! So, if hypervalency is to survive as a concept, the hunt must surely be on for one unambiguous, as yet to be found, example of the phenomenon in the main group. This entry was posted on Sunday, October 17th, 2010 at 8:09 am and is filed under Hypervalency. You can follow any responses to this entry through the RSS 2.0 feed. You can leave a response, or trackback from your own site. I noted above that the calculation for I(CN)7 revealed I-C bond lengths of ~2.1 (axial) and ~2.2 (equatorial), this at a reasonably good basis set level. What does the Cambridge crystal database have to say about C-I lengths? Well, there are around 11 structures in which iodomethane is a component, and the C-I bond in these is around 2.1Å. There are four structures containing I-CN motifs (TOQCEI, TOQCIM, TOQCOS, YUHLOD). There the average I-C length is ~2.25Å. So I(CN)7 appears to have normal I-C single bonds, judged purely by their length. What does this suggest? Well, perhaps one cannot use purely bond lengths to decide if a compound is hypervalent or not. There is nevertheless a contradiction. The Wiberg bond order (which treats the filled iodine 5d shell as non-bonding) suggests that the C-I bond orders in I(CN)7 are very much less than one. On the other hand, the ELF analysis clearly reveals a disynaptic basin in the I-C region which integrates to ~2.5 electrons (formally a 1.25 bond order), ie slightly strong than a single bond. It seems that this picture matches the bond lengths rather better. The implication is that the 5d electrons are not entirely passive. So there are certainly questions which need answers for this type of molecule. Analysing bonding is a bit like describing the cheshire cat, it can often be just a smile, without the substance of a body. In the post above, I described the ELF results for I(CN)7 in which a valence shell of 17.5 electrons were distributed in 7 apparently disynaptic basins. However I mis-labelled my shells! In the calculation used (basis set Def2-TZVPP) an effective iodine core of 28 electrons includes an argon core (18) and ten from the 4d shell. A further 25 electrons bring the count up to 53, and these are distributed 8 in 4s/4p, 10 in 5d and 7 in 5s/5p. The ELF for iodine (showed) 17.78 of these in a monosynaptic basin, and a further 17.5 electrons in what are labelled disynaptic basins connecting I and C (of the CN). In fact, the distinction between a mono and a disynaptic basin in ELF can be a knife-edged one. If its disynaptic, then these 17.5 electrons must populate as 8 in the iodine 5s/5p shell, and 10 in the iodine 6d shell (and not the 5d shell as I wrote above). If the seven basins are monosynaptic, then they would correspond to lone pairs on the carbon. In other words, the cyano group would in fact be a cyanide anion, CN–. This returns us to the problem I discussed in the blog; that of distinguishing between an ionic bond (with monosynaptic basins) and a covalent bond (with disynaptic basins). So, like the smile on the Cheshire cat, we are back to arguing whether I(CN)7 is ionic or covalent. If the latter, the ELF analysis (if believable) still suggests that d-electrons might be participating. If that were to be the case, then the iodine would have to be treated as a transition series element, and not a main group element. Quite a change in the way we think about it. So this leads us inexorably to finding a molecule where these issues are less ambiguous. I will shortly document I8, i.e. II7 and As8, on the assumption that if any bond is going to be clearly covalent, it should be one comprising homonuclear (i.e. the same) atoms. Interesting questions Matthew, to which I do not have an immediate answer. I did include a link to the checkpoint file, so you can have a look at the wavefunction yourself if you wish. If you manage to provide answers, I would be very interested! And as you showed, a diffuse basis leads to diffuse Rydberg electrons. On a different matter, Peter Gill has a fascinating new way of thinking about density functional theory. A boundary of conventional DFT is the “uniform electron gas”, which of course extends to infinity. In other words, it is “diffuse”. Peter instead constructs the density on a 3-sphere (a 4 dimensional object) which is not infinitely “diffuse”. One can only wonder whether such an approach leads to entirely new ways of thinking about diffuse Rydberg populations, and whether non zero occupancy of these Rydberg orbitals means hypervalency or not. See 10.1063/1.3665393 or 10.1007/s00214-011-1069-7 for more.